Starring Ed Helms, Jon Hamm, Jake Johnson, Jeremy Renner, Annabelle Wallis, Hannibal Buress, Isla Fisher, Rashida Jones, Leslie Bibb, Brian Dennehy, Nora Dunn, Steve Berg, Lil Rel Howery, and Thomas Middleditch. Sometimes there are stories so outlandish and silly that you can’t help but feel they would never happen in real life. Tag is one of those stories, except the events depicted are inspired by a real group of friends who have played the same game of tag for over 30 years. 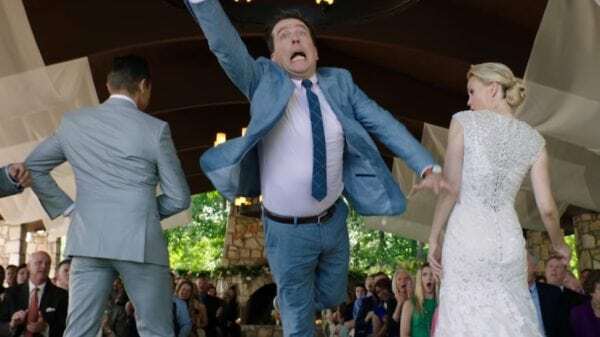 The film revolves around the group of friends returning to their hometown as their friend Jerry, who has never been caught, is about to get married and the group dedicate themselves to finally tagging him before he does. The blu-ray release of Tag delivers a fairly funny and entertaining film while its special features delve a little bit into the real life people that inspired the film. The one aspect of Tag that works really well is the ensemble cast. 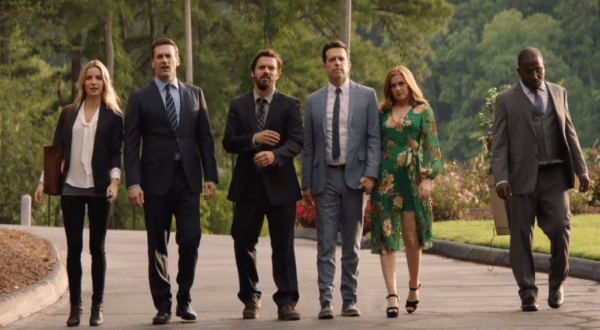 Ed Helms, Jon Hamm, Jake Johnson, Hannibal Buress and Jeremy Renner have a lot of chemistry together as the dedicated and dysfunctional group of friends. Each of them are fairly balanced and have their own moments to shine, though Helms and Hamm are given a bit more prominence above the others. Isla Fisher and Annabelle Wallis also provide some good material, with Fisher’s character being a way too intense supporter of the game. The only downside to them, though, is how Tag often doesn’t know quite what to do with Fisher and Wallis as Fisher’s character sits on the sidelines and Wallis, the journalist who is following the story, doesn’t even appear in some of the wackier moments of their game. The comedy works pretty well throughout the film with most of the jokes feeling natural. As said previously, each of the actor’s are fairly balanced with their comedic moments and deliver some good jokes and one-liners. A couple aspects are close to being overused, however, such as Johnson’s pot-head smoking character who spends most of the film high or the awkward personality of Buress’, as its the same shtick over and over again. Their character’s quirks don’t get too much in the way of the film, but at times it can be a bit tiring, especially since few of the character’s really develop further by the end of the film. Tag also cleverly mixes in the action genre. 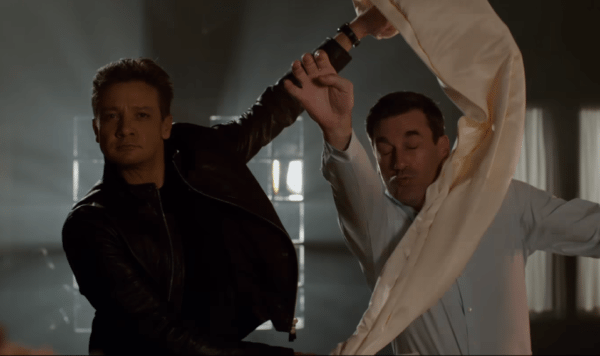 You wouldn’t think watching grown men play tag would be exciting, but director Jeff Tomsic amps up the ante during the tag sequences with Renner’s Jerry, who takes things too far when evading capture. His introductory moment allows him to plan out his defence ala Sherlock Holmes in the Robert Downey Jr. films while a golf car chase escalates into something akin to a horror film as they find themselves lost in the forest at Jerry’s mercy, which turns out to be the best scene in the film. Renner steals the show during these scenes as he plays Jerry with a very straight-forward and intense approach. The one thing that can be said about Jerry and some of the other characters is they verge on being unlikable, especially as things escalate and certain moral lines are crossed in order to either tag Jerry or avoid being tagged. The film’s message about keeping close friendships and using the game as an excuse to keep in contact almost gets muddled, but it comes back around in the end to focus more on why they played tag for so long instead of the game’s crazy antics. As for special features, the Blu-ray doesn’t consist of too much, but they’re still worth watching. There’s roughly 8 minutes of deleted scenes and bloopers each with the deletions offering some more jokes, but its easy to see why they were cut. The bloopers are fairly funny and we get to see some different lines from Hannibal Buress as he improvs his material in different cuts. The draw of the Blu-ray, however, is ‘Meet The Real Tag Brothers’, an almost 10-minute feature that looks at the real people that inspired the film. It goes into why they’ve kept up the game for so long and also reveals some of the crazier elements, such as Helm’s various disguises or players teaming up to catch another person, are actually based off real events in their game. It’s a nice look at what’s kept them together and why their story seemed worthy of a full-length feature film. 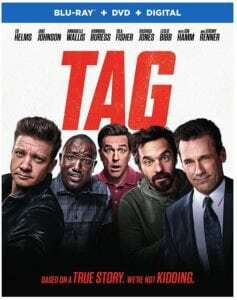 Tag takes an unlikely but true premise and turns it into a very funny and entertaining comedy with plenty of laughs. The ensemble cast is great together, though some of the actors could have been given a bit more to do throughout the film. The blending of its comedic and ‘action’ moments works well and though it’s message my get a little lost at various points, it comes round in the end.